So I was at VivoCity yesterday helping my wife who had a weekend stall there to sell her handmade bags. I saw celebrity entrepreneur Elim Chew, founder of 77th Street, and sneakily took this picture of her with my iPhone. 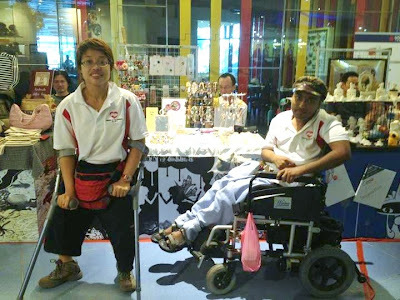 Ms Chew also took some pictures of her own at Vivo and posted them on Facebook. This is one of them. You can see me at the back on left. Oh yeah, I photobombed her! The other celebrity I spotted at Vivo yesterday was former national swimmer and now coach Ang Peng Siong. Unfortunately, I wasn't quick enough with my iPhone to take his picture. He's greyer but still in pretty good shape. The last time I saw Ang was in 2006 at Farrer Park Swimming Complex. I was there to shoot an episode of Phua Chu Kang and he happened to be there conducting training (I think). By incredible coincidence, his name was actually mentioned in a line of dialogue in the script I wrote for the episode. So I asked someone to ask Ang if he was willing to make a cameo appearance. The one-time World's Fastest Swimmer was nice enough to say yes. So the great Ang Peng Siong appears at the very end of the episode as part of the post-credits blooper reel in the video below. 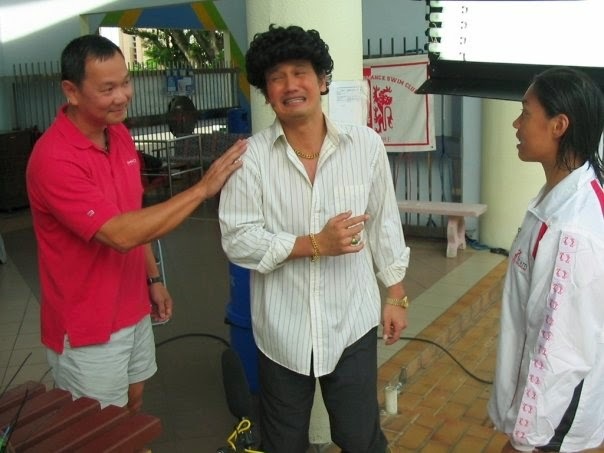 On the same hot day we got lucky with Ang Peng Siong, we didn't get so lucky with Moses Lim, who guest starred as Tan Ah Teck, reprising his role from the groundbreaking local sitcom Under One Roof. He collapsed from heat exhaustion next to the pool. For a few alarming moments, I was worried I would be condemned by history as the man responsible for the death of Singapore comedy icon, Tan Ah Teck. I mean, he was never the fittest looking guy. I mean, he's no Ang Peng Siong. I mean, he's really fat. And he wasn't young even then. I admit as the executive producer, I was more concerned about my production schedule than the man himself. But Moses soon recovered and even insisted on finishing the pool scenes. What a trouper! But that was a quite a scare. Because she did a great job in this episode (she came up with the line "Game on! 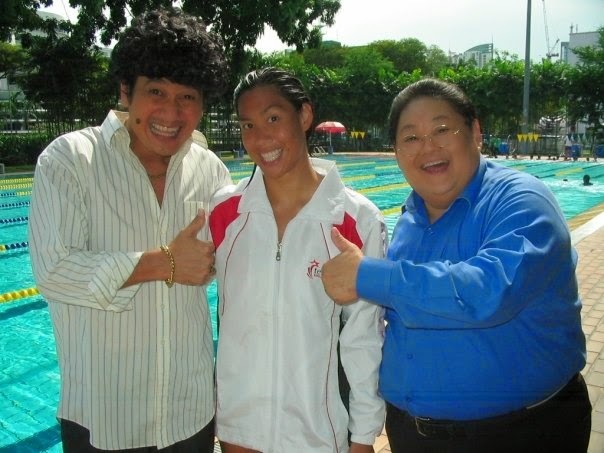 "), I invited national swimmer Joscelin Yeo to be in the PCK series finale special months later. She said she couldn't make it. The day after the special was filmed, the news was that she had announced her retirement from competitive swimming. So that was why she couldn't make it! So that night marked the end of two eras, PCK on TV and Joscelin in competition. She would later become NMP and PCK would later go to Malaysia. The girl playing future fat Phua Chu Kang's grand-daughter in the episode is Gurmit Singh's real-life daughter, Gabrielle. I also have a cameo in the episode in the reverse bungee scene. See if you can spot me in my tank top and shorts. The hot babe at the end of the episode was the reigning Miss Singapore Universe at the time, Carol Cheong. She's still my favourite Miss Singapore Universe.